Slay: Put a Completed Contract into your hand. Brotherhood Slayer is a common Agility creature card. 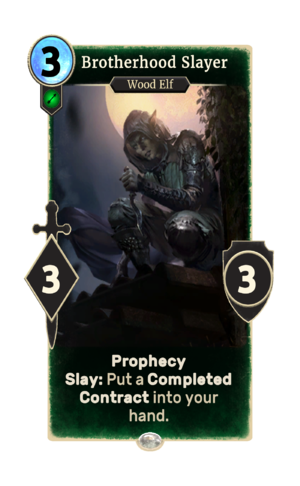 It is part of the Dark Brotherhood story set. A playset of the card is awarded for completing Kastus Thorn's House. The premium version can only be obtained by soul-summoning, which is only possible after the completion of Kastus Thorn's House. "Just give me a name." The card's art was created by Nuare Studio. In Daggerfall, "Slayers" were the Dark Brotherhood members who offered contracts to be completed. In Oblivion, "Slayer" was a low rank in the Dark Brotherhood faction. This page was last modified on 27 February 2019, at 21:42.